Rouleaux formation is the first and most robust phase of RBC sedimentation after disaggregating (mixing) RBCs in whole blood samples. 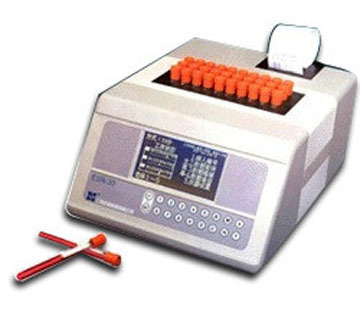 Automatic Erythrocyte Sedimentation Rate (ESR) Dynamic Analyzer (ESR-30), New Delhi. The erythrocyte sedimentation rate (ESR), also called a sedimentation rate or Westergren ESR, is the rate at which red blood cells sediment in a period of one hour. It is a common hematology test, and is a non-specific measure of inflammation. To perform the test, anticoagulated blood is placed in an upright tube, known as a Westergren tube, and the rate at which the red blood cells fall is measured and reported in mm/h. 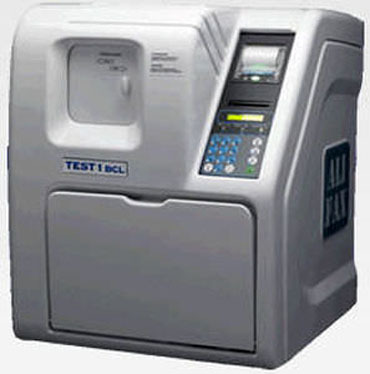 Since the introduction of automated analyzers into the clinical laboratory, the ESR test has been automatically performed. The ESR is governed by the balance between pro-sedimentation factors, mainly fibrinogen, and those factors resisting sedimentation, namely the negative charge of the erythrocytes (zeta potential). When an inflammatory process is present, the high proportion of fibrinogen in the blood causes red blood cells to stick to each other. The red cells form stacks called 'rouleaux,' which settle faster. Rouleaux formation can also occur in association with some lymphoproliferative disorders in which one or more immunoglobulins are secreted in high amounts. Rouleaux formation can, however, be a normal physiological finding in horses, cats, and pigs. 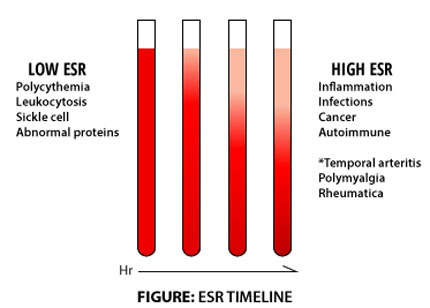 The ESR is increased by any cause or focus of inflammation. The ESR is increased in pregnancy, inflammation, anemia or rheumatoid arthritis, and decreased in polycythemia, sickle cell anemia, hereditary spherocytosis, and congestive heart failure. It may be increased in kidney cancer. The basal ESR is slightly higher in females. It can sometimes be useful in diagnosing some diseases, such as multiple myeloma, temporal arteritis, polymyalgia rheumatica, various auto-immune diseases, systemic lupus erythematosus, rheumatoid arthritis, and chronic kidney diseases. In many of these cases, the ESR may exceed 100 mm/hour. It is commonly used for a differential diagnosis for Kawasaki's disease and it may be increased in some chronic infective conditions like tuberculosis and infective endocarditis. It is a component of the PCDAI (Pediatric Crohn's Disease Activity Index), an index for assessment of severity of inflammatory bowel disease in children. The clinical usefulness of ESR is limited to monitoring the response to therapy in certain inflammatory diseases such as temporal arteritis, polymyalgia rheumatica and rheumatoid arthritis. It can also be used as a crude measure of response in Hodgkin's lymphoma. Additionally, ESR levels are used to define one of the several possible adverse prognostic factors in the staging of Hodgkin's lymphoma. Westergren's original normal values (men 3mm and women 7mm) made no allowance for a person's age and in 1967 it was confirmed that ESR values tend to rise with age and to be generally higher in women. Values are increased in states of anemia, and in black populations. What Is the Difference Between an ESR and CRP Test? The erythrocyte sedimentation rate (ESR) test and the C-reactive protein (CRP) test are laboratory blood tests that healthcare professionals use to detect and monitor inflammation in the body. Both ESR and CRP are increased in the presence of acute inflammatory conditions, such as rheumatoid arthritis, polymyalgia rheumatica, inflammatory bowel disease, and other autoimmune conditions. The ESR measures the rate at which red blood cells separate from the fluid component of blood, the serum, with an increased rate of separation indicative of increased blood protein levels of fibrinogen, immunoglobulins, and other chemical agents that are present in inflammatory states. On the other hand, CRP measures the level of C-reactive protein, a substance that is generated by the liver in infectious or inflammatory situations. As a result, while both may indicate inflammation, ESR is an indirect sign of the condition and CRP is a direct indicator of it. These tests are also useful to monitor the activity of autoimmune diseases and the patient's response to any medications that physicians prescribe to treat the condition. Changes in ESR are slower than changes in CRP, so it is a less sensitive indicator. In addition, many non-inflammatory conditions may elevate the ESR, such as anemia, menstruation, pregnancy, and use of a variety of medications. While both tests are readily available commercially, the ESR test is easier and less expensive than CRP. Recent studies indicate that ESR tests may play a beneficial role in screening elderly patients for occult disease. A radical increase of the ESR strongly suggests a problem, most often an autoimmune disease, infection, or even a spreading cancer. Many patients with an ESR level exceeding 100 have myeloma, a condition in which certain white blood cells proliferate excessively and destroy body organs. As a result, a high level in an elderly patient may require further testing, such as additional blood and urine tests, chest X-rays, and liver function tests.